The city's next planned addition, meant to connect the Hunter Street GO Station to the greater cycling grid, is a step [Stacie] McCormick calls out of balance. The salon owner is protesting an $80,000 plan to squeeze bike lanes along the downtown street in July, possibly axing up to 16 metered parking spaces near her business. This is exactly what I envision for Hunter Street. As we know, only 7,000 cars per day use Hunter. The industry standard is 8,000-9,000 vehicles per lane in North American cities, so one traffic lane can more than handle the volume. Where any left or right turn lanes are actually needed we can allow for those turning lanes by removing the final few street parking spots before a signalized intersection. If a right turn lane is needed at John, the main westbound traffic lane simply veers into the place of the parking lane and creates room for the right turn lane. Ditto for a left turn lane at James, right turn lane at Bay, and so on. Two-way protected bike lane on the south curb. I agree with the salon owner that removing car parking is counter-productive to a complete street - especially on such a lightly traveled street as Hunter. Here is Hunter east of Bay Street in the middle of the afternoon today. Like so many of our one-way streets with timed lights, there are large gaps with no cars at all, punctuated by clumps of cars all racing together. And here is Hunter east of John Street, also in the middle of the afternoon today. I had to wait for three light cycles before I even saw any vehicles, and then a whopping three cars flew by. My goodness, if we can't remove a traffic lane here, we all need to pack up and move instead of kidding ourselves that the city will ever get around to turning Main/King/Cannon into complete streets. As you know, New York City has been rapidly removing car lanes in favour of safe, protected bike lanes. From huge avenues in Manhattan and Brooklyn to more neighbourhood streets throughout the city, they are rapidly building a safe bike network. Hamilton has gobs of excess lane capacity that NYC doesn't have. There is no reason we can't move at least as quickly on our bike network. Another option could be to turn Hunter into 2-way for bikes and cars. But that would mean no room for on-street parking at all. A road diet as you suggest would actually make it easier to continue the proposed bike lane all the way on Hunter past the GO Station. When Bratina was Ward 2 Councillor he got staff to change the draft route to not have a bike lane in front of the GO station because he didn't want to lose any parking there. 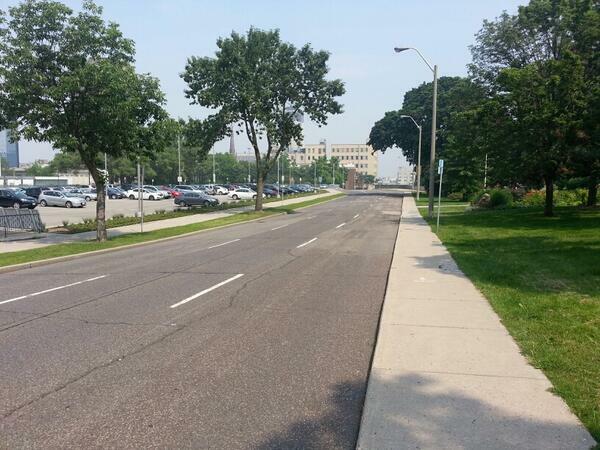 But with so much short term parking in front of the GO Station, how would it work to just have one car travel lane? Wouldn't it be blocked multiple times an hour from cars trying to park? Would people adjust or would they blame the bike lane and create more animosity towards cyclists? From the pics of Kent Ave in Brooklyn, maybe parking is quicker next to bike lane because drivers can miss a bit without hitting the curb and re-adjust more easily? 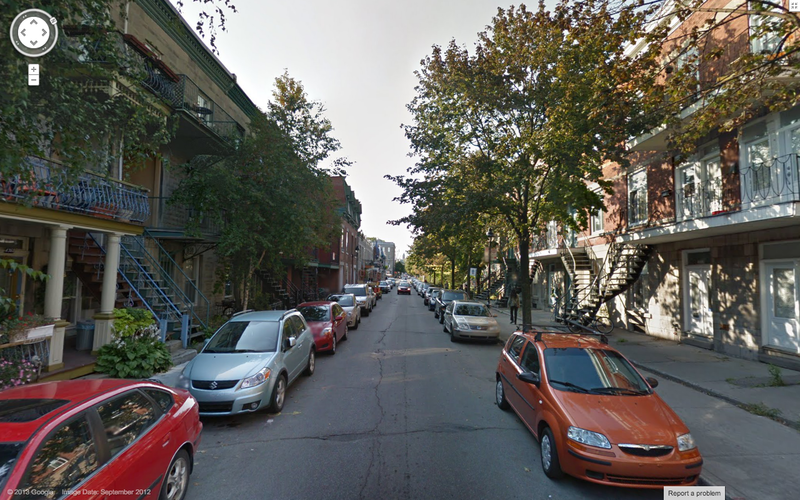 Laurier Ave in Montreal has seen a similar road diet (now 1 lane car travel, 1 lane parking, 2-way bike lane, much wider sidewalks) and I'll take some pics this summer and post them here for comparison. I suspect that most if not all of Walnut to James would be barrier-free bike lanes. The Hunter kiss-and-ride complicates things. It might not look it at all times, but there are often two lanes blocked in front of the GO just from drivers trying to pick up passengers or cabbies ferrying a fare. The HSR also keeps active standby stock idling on the south curb of Hunter, between John and GO's access ramp. Why the concern for "up to" 16 spots lost on hunter when walnut is an oasis of free street parking as far as the eye can see? Jason, you make great points and I totally agree with you. If we can’t take a street like Hunter and make it a complete street we are in big trouble. I ride my bike and drive my car depending on the situation, but I don’t think I would ever have myself and my niece/nephew biking along side 2 lanes of racing one way traffic no matter how large the bike lane is, I still wouldn’t feel safe. Using a parking lane to block/protect the bike lane from any traffic and limiting the moving vehilce lane would be ideal. I think the Spec article actually failed to mention that the total parking loss is actually 27 spots, 16 meters and 11 free spots. They are planning to get rid of all parking on Hunter from Liberty to Catharine. The 16 meters are more for the business area of the street however the 11 free spots down near Liberty are always at capacity. These are used by the residents of the condo and aparment buildings and their guests as they both do not have visitor or guest parking. Additionally, very few of the houses (some being 4-plexes) in the effected area have driveways so if they lose their free/accessible parking, it’s going to implact them tremendously. Not sure about the comment concerning a sea of parking on Walnut. Walnut has very little parking. The few free spots are utilized by residents who again, don’t have driveways and those exact spots are being considered as the ‘alternative’ parking option, thereby making them metered parking. A bike lane would definitely enhance the area if implemented correctly and not at the cost of how people live everyday. If a bike lane is provided and minimal parking is lost, time will tell if a transition from car centric thinking to other means of transportation will occur. This can’t be forced though. You can’t remove all car accessibility to an area, provide a bike lane and think everyone is going to be happy, sell their cars and ride their bikes everywhere. Give people options instead of hurdles. Fred: the Go station definitely complicates things if the bike lane is to actually be built there. There were conflicting plans from the Project Manager and Councillor. The Project Manager said that eventually the bike lane would go all the way down Hunter when construction to the Kiss and Drop is done. The Councillor actually said that the Hunter bike lane will stop at Catharine, eventually go up Catherine (guessing when it goes 2 ways) and then down Jackson and that is as close as it will get to the Go Station. We really don't need 2 travel lanes. So the easy solution is a bike lane, parking, and one travel lane. But let's be honest about this petition - Hamilton is awash in parking. What will really help these businesses is to make the downtown a desirable place to live. And ample parking is not the way to do it. This isn't the suburbs. The following image shows a 250m radius around Strut. 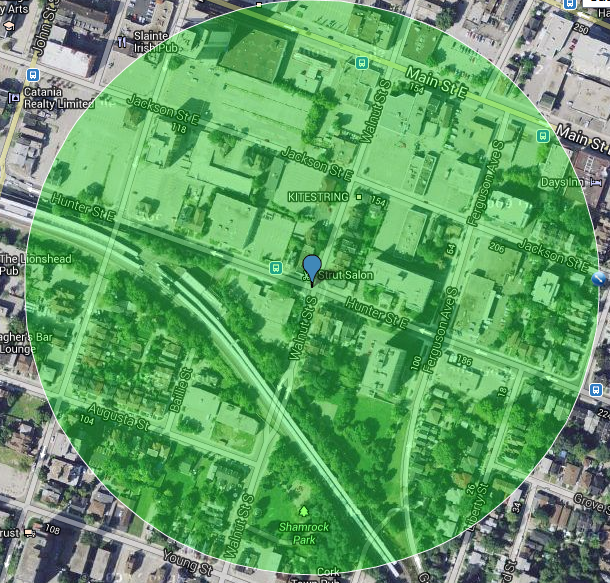 Look at how much surface parking lies within this circle. Compare it to the square footage dedicated to business use. The ratio is appalling. There is no way that the few tiny businesses at that corner are using all of these spots. The problem is we have too much cheap parking and lax time limit rules. All of our side streets in the core should have "except by permit" 2 hour limits, and if residents need to park on the street they have to buy a permit. We also need better alternative transit connections to the hunter GO terminal, as a huge part of the parking "problem" in this area is long term commuter parking. More bike lanes are part of the solution, not part of the problem. We need to get people to the GO without their cars. I'm sorry but this petition is nimbyism. This view of meter parking being the driver of business is myopic. Downtown businesses should be fighting for better balance, less space for cars, more space for people, relaxed zoning for intensification, and other progressive ideas proven to work. Cars don't spend money. People do. WE NEED MORE RESIDENTS NOT MORE PARKING SPACES. I certainly agree with you, however I see curb parking as more than just parking - it is one piece of a complete street that provides a buffer for pedestrians, and the more curbside parking we get, the less need there is for off-street parking in those gross lots. I'd love to add curb parking on virtually every street downtown. Less business for the parking lot owners, and immediately it helps to create safer walking conditions. In the Hunter context, if we have to choose to remove curb parking or a travel lane, to me the option is a no-brainer. In front of the GO Station, I see no reason why the bike lanes (assuming they are on the south curb) can't continue straight through past James by simply moving the parking bay into the current south travel lane. One full travel lane would remain, and parking on the north curb would remain. At James, the left turn lane would also remain. Hunter is literally one of the simplest streets to add a protected 2-way bike path into. From Queen to Wellington. Again, I'm concerned that we can't even do something like this that is so simple and easy to figure out. With all the wisdom and examples provided by other cities, one wonders what exactly city staff are doing when presenting such a disjointed plan for an otherwise great idea. It seems to me that we're trying to shoe-horn bike lanes into the city without sacrificing a single inch of car speed or space. That has to change. seancb: I think you are right, we need to make the downtown a desirable place to live. I’m not sure if (at this time) the majority of people would think an area where they can’t park their vehicle is a good residential/business investment. Everyone is entitled to their opinion, however I don’t consider the petition NIMBY at all. People aren’t opposed to a bike lane, many people, STRUT included would like a bike lane. The issue is losing all parking for almost a km. They are simply asking for a better plan where a bike lane and parking can coexist. I don’t think this is an issue of bikes vs. vehicles vs. business… it’s simply lets work together and get proper community street planning. Many homes and many commercial properties in the core have no dedicated parking, and their property values are climbing. In most cities, parking amenities are considered a bonus, not a requirement. People looking to move to dense urban areas are looking for a lifestyle where they don't have to drive everywhere - and many want to ditch their cars entirely. This is the momentum we need to nurture as the end result will be more residents and more customers with no increased parking requirements. Perhaps the petition could have been worded in SUPPORT of reducing Hunter to one car lane, and maintaining parking as part of the plan. Or in support of some other better alternative. But it's worded negatively, so it is being viewed and spread as anti-bike-lane. (I also think the hyperbolic bit about it being unsafe to walk in that area at night is unnecessary). This city is already slow to make the changes necessary for its survival; I find it disheartening to see residents and business owners fighting the small progressive steps the city takes. This tact makes the city even more timid, and further slows down the progress we so desperately need. The negative slant of petitions like this one are detrimental to our progress and the overall good that complete streets and intensification will bring to these businesses (and residents' property values). When you say "at this time", it makes me wonder: WHEN is the time? When will we embrace the concept of density - the only viable answer to the financial and social problems facing Hamilton? When will we stop bowing to the deity of high speeds and ample parking? That god has not served us very well over the last 60 years. Will we wait til next year? The year after? Or will it be another 60 years of this mentality, and the next generation fighting the same battles? I live just down the street from Strut and I understand parking frustrations. My store is located on an urban block where 4 parking spaces serve 8-10 businesses. I do get questions sometimes about where my customers should park, and I have to explain to them that they may need to walk a block or two. But I understand that the future of Hamilton lies in looking past the short term pain of parking a block away from your destination, towards a vision where there are so many people who LIVE within walking distance that parking doesn't matter. I'm sorry to hear about your experiences. We have found it to be mostly pleasant, with of course a few "incidents" on the street which we expect to encounter from time to time as part of being in a mixed urban neighbourhood (especially being around the corner from a bar district). I just really feel that a petition fighting FOR a better plan could be more constructive than a negative one. The over abundance of parking, with lots of free street parking is definetely worth better understanding. In fact very few residents would be using the free parking spots on Hunter, as it is a through streets, so no overnight parking is allowed. Also, the free spots on Hunter are almost all taken up during the day, indicating use by commuter car drivers. More data would be useful, but my guess is that most of the free spots along Hunter are used by out of area commuters who then walk to work closer to John or Main. An easy way to check would be to see how many of the free spots are still taken at 5pm today. Another big use of the free spots would also be GO commuters, who drive then walk to the GO Station a few blocks. But the resident parking argument is overstated I think. Street parking for residents is something we should all want more of. The alternative is more off-street parking, front yard parking and parking lots. Any vibrant city I've been to is loaded with curb parking - from Portland to NY to Montreal. Agreed. Walnut should have two-sided street parking from Hunter to Charlton. If two cars pass each other and have to slow down, all the better. And I just rode past Catharine at Hunter - which reminded me - why is it THREE LANES? That should be 2-sided street parking as well. totally. Yes I was on Catharine today too. Just mind-boggling. Lol I went back and looked up the traffic data. It carries 3,400 cars per day at King!! What the heck are we doing with 3 full lanes?? Entire swaths of this city have been completely ignored for decades by city hall. Which is easy of course, when nobody lives here. Catharine should have parking on both sides, ditto for Walnut and we can still retain parking on one-side of Hunter with the 2-way bike lanes. And car traffic wouldn't be impacted in the slightest. The rub may be that, as you put it, "nobody lives here." The City may be miserable at reactive investment, but it's pretty much hopeless when it comes to proactive investment. Spending millions in depopulated neighbourhoods is bound to require some deft politicking. That's a petition I can get behind! Thank you Ryan for your article supporting the idea that we don't need to lose curbside parking. Our petition has always been pro bike lane, but more specifically it's pro parking, which so many people seem to have a problem with. My apologies if the text on the petition didn't make that clear. Like it or not, people are still going to drive. In a perfect world, we would all ride our bikes or take public transit.. we have both a bike rack and a bus stop outside of the salon for those reasons. We didn't state the idea of taking Hunter down to one lane on the petition because there were quite a few alternative ideas being considered at that time. We just wanted to get it out there as soon as possible and let others have a say and be informed as to what is going to happen in their neighbourhood. Isn't that what a petition is for? To call my stance on the issue "nimby" is ignorant. I've never once said "no bike lanes here, please". I've simply stated that there has to be a better alternative. Is it wrong for me to defend the livelihood of the business that I've worked so hard for the past 7 years and the livelihood of the people that work here? It's not the bike lane that will affect our business negatively, it's the parking. Also, it's not 16 spaces that are at risk, it's 27. I checked at noon and 23 of the 27 spaces were full. We have 7 stylists here and see hundreds of people a week. Sean when you opened your business you were fully aware of the parking situation around your space. When I bought this building I did so knowing that I had access to close street parking. To take that away and risk the success of a local small business is not a "progressive" move. If business decreases and we lose clients, I don't have the option to just move. I own this building and to pick up and move to a place with better parking isn't an option. 30-40% of our clientele come from out of town. They need a place to park, and many of them are elderly or mobility challenged. Many of our clients would have no problem with walking a city block to visit us but many simply can't. Many won't do it after dark and many won't do it in the dead of winter. Not to mention the lots on Hunter and Catharine and Walnut and Jackson are often full, the one on Walnut is Imperial so very expensive and so quick to ticket. Many people coming into Hamilton already complain about parking issues, and this won't help. I would love to just do the hair of Hamiltonians, because we are, after all, the coolest, but you have to consider the idea that we bring people to the hammer from Barrie, Toronto, small town Ontario, even as far as Vancouver and England. Isn't that a great thing? A small business bringing in people to check out our beautiful city? For us to recommend restaurants, galleries and events to? The comment about Walnut being "an oasis of free parking" is a fantasy. There are 5. They are used by the residents and they are used for overnight parking. I've spoken to them. I went door to door when I was first informed of the project. Sara saying that the resident parking argument is overstated couldn't be further from the truth. I urge you to talk to them first before making assumptions. Most of the residents I spoke to said that this would negatively impact their lives (losing parking) and many came into the salon to sign our paper petition (which now has over 350 signatures). I've just been informed that there will be a community meeting with Mr.Farr to further discuss the residents disapproval with losing parking. Changing Hunter to one lane seems so be a great alternative, as it will slow down traffic. It's not a busy street but when the traffic does flow, it's way too fast. This corner is dangerous and even has a high-crash zone sign to prove it. When I first started this petition and argument to keep the parking on Hunter I thought it was a no-brainer; a bike lane, parking and traffic could live cohesively on one street as it does in so many other urban cities. I thought that the City of Hamilton could do better for us. That's all. No anti-bike lane, no anti-cyclists. I'll be sure to post the date of the community meeting if anyone should choose to come. I don't think your math is honest cause you are counting 27 missing spots along how many blocks of hunter? But with the available spots on other streets you only are willing to count it if its within one block of your corner! How many hunter spots are being lost that are only a block or less away? And do you and your employees use any of them if they are empty when you get to work? Or do you guys park in a lot every day In order to save spots for customers? Of your hundreds of customers a week, how many are there at the same time? 10 Max? And how many will truly find a different hairstylist if they have to park a block or two away? All valid questions I think! Hi Stacie, thanks for sharing your helpful comments. It seems to me that the most sensible definition of a "complete street" is a street that accommodates everyone, including drivers. I must admit I'm conflicted about Hunter because I'd love to see it converted to two-way, but with just three lanes to work with and a City that actually seems committed to adding protected bike lanes, I can live with keeping it one-way as long as we keep a lane of curbside parking and add the protected bike lanes. But to maintain two one-way driving lanes makes no sense, especially given the traffic volumes on the street. I don't mean to be argumentative (although I am a serial ranter) since I think we all have our goals in the same line. I just wish this could be framed in a more progressive way. When I first heard about the petition, it was with a group of people having dinner and the news came to us conversationally as "there's a petition to fight the hunter bike lanes because of lost parking spaces". I can see that the spirit is not really like that, but it's the reality of how peoples' minds distill these things - including city staff and council. The risk is that bike network implementation gets slowed down... any resident push-back to bike infrastructure is just another excuse for the city to drag its feet. And it seems like the battle is often distilled down to parking vs bike lanes as if you can't have both. Anyways, on to more ideas... could we ask for more parking on Walnut? People use the street inappropriately now - as a through street (shortcut). More parking spots could serve the businesses and residents in more ways than one - it could act as a traffic calming measure as well as providing parking. And the city seems to react more positively if we ask for parking. It's like they are addicted to creating parking spaces. We also need a better system to prevent all-day parking at street spots. We have the same problem outside of the bike shop. People feed the meter all day because it's so cheap. Or they sit in their car for an hour, not paying, while waiting for methadone. So of the 27 spots on hunter, how many are available during business hours to customers stopping for 2 hours or less? how many are occupied semi-permanently by commuters, workers or residents who should probably be parking somewhere else? My personal thought is that Hunter would work best as a calm two way street with parking - and we wouldn't even need dedicated bike lanes at all, as traffic would move at a more reasonable speed. But asking for two way conversions is like poison to the city, and I hate to complain about any bike infrastructure that the city builds as we need as much of it as we can get at the moment. "We also need a better system to prevent all-day parking at street spots". I agree. For some reason the Durand neighbourhood (in particular Herkimer St.) is somehow expected to serve as some sort of free parking zone for the employees of St. Joe's who don't want to pay to park on site at the hospital. The result is cars and trucks parked for entire 12 hour shifts in front of the neighbourhood homes. Once you are west of Bay parking is free all day everyday (disclaimer: you'll have to wait until 9 AM to park on the north side of Herkimer). I recall our esteemed Mayor musing that the conversion of Herkimer to two-way traffic would eliminate curbside parking on one side of the street. "How would the residents feel about that" he asked. Well since you can't park on Herkimer from 2 AM to 7 AM, and almost all residents have on property parking; I'm betting the residents will be fine with that, your squelching, "oh god the sky is falling" minority will be employees of St. Joe's who, like so many others who work in the core, will have to (gasp!) PAY for their parking. There oughta be a law against that........paying for parking in the core of a top 10 Canadian metropolitan centre....we can't have that. Come to Westdale and you will find the most ruthlessly efficient parking enforcement you've ever seen. The city's vigilance with parking enforcement in the area around McMaster U is spectacular, and I imagine it's also lucrative. Parking fines are nothing to sneeze at, and I'd wager the bylaw officers pay their own salaries. I wonder whose ear you need to bend at City Hall to get them to pilot that kind of treatment in the area around St. Joe's. I think there's much we can do with Hunter. I'd love to see this type of street on Hunter and on Wellington south of the cut. This would connect the bike lanes on Stinson with downtown and it would make walking a lot nicer. Hunter could still open up between John and Bay and then narrow again after to facilitate the Station. I'm all for resident permit parking. Drive ways certainly add value of your home, but street parking is an urban fact of life, plus it shelters the sidewalks. I think it's much needed in the higher density parts of the core. Sorry, that posted prematurely, and doubly. If the mods could erase the preceding two posts it would be great! I live on Walnut. The parking spots on Hunter are rarely full, except for a few across from Strut when it is open. The proposed new metered spots south of Hunter are currently free but 'stolen' by 9-5 commuters - most likely not from the downtown. Turning those into metered spots will essentially kick out the commuters, and more than make up for the Strut parking on Hunter. Because it takes approx. 25 seconds to walk between these two areas, and because there are city and private parking lots within another minute or two of Strut, I do not think feel it is necessary to keep parking on Hunter at all. Although I would support converting Hunter to two-way and adding a bike lane with some parking, I think it is still better to have the parking spots replaced by much needed bike lanes (badly needed in downtown Hamilton) than remain as rarely used parking spots. Downtown Hamilton is much more car-centric than it needs to be, and it would be a shame to not implement this badly needed bike infrastructure because one business needs extra close parking. The owner of Strut has written a letter to everyone in the neighbourhood claiming that not only will the neighbourhood suffer because of these bike lanes, but that EVERYONE'S PROPERTY VALUES WILL GO DOWN. I have no idea where an idea like this would come from (and actually think over time it will have the opposite effect) and disagree wholeheartedly with people coming into the neighbourhood to scare its residents like this. I'm going to agree with seancb here and call NIMBY. I think if the bike lane goes on another street, local businesses there will crawl out of the woodwork and complain too. This is about parking for one business. Lets not be fooled by the "lets all get along" angle. Do not misquote me. I did NOT put a letter in everyone's mailboxes saying that a bike lane would decrease property values. I said "having no parking options can negatively effect property values", which was told to me by various local real estate agents. And I didn't say that the neighbourhood would suffer if we got bike lanes. It's pretty irresponsible to put words in my mouth and have people believe things that aren't true, don't you think. I put the notes in the mailboxes of the residents that would be directly effected by the project (many of them friends and clients) so that they could be informed about it, because no one had any idea that this was about to happen. I gave the contacts of the councilor and the project manager so people could become more informed and voice their support or concerns. At that time, the City informed me that the project was moving forward in the very near future without letting the rest of the neighbours know. I also mentioned that the City can do better, and come up with an alternative that we can all be happy with. Not sure your motivation here, as the "let's all get along angle" you've pinned on me is more of a judgement of character then trying to come up with solutions. I've tried to contact you personally instead of calling you out for lying on a public forum and ask you to retract your statement but clearly this hasn't happened. Just wanted to clear the air so everyone doesn't think I'm "NIMBY". To clarify, just because I don't want to lose parking around my business doesn't mean in the least that I'm anti-bike lane. The street can accommodate both. It seems we both agree that downtown is way more car-centric than it needs to be. So, why not lose a lane of Hunter instead of axing curb parking? Curb parking is a great feature of urban life that can buffer these bike lanes, and prevent homeowners from getting the itch to cut down trees, and pave over front gardens with mini-driveways. Hunter carries 7,000 cars per day at it's busiest spot (in front of GO Station). Downtown traffic lanes are meant to carry between 7,000-9,000 cars per day/per lane. So 1 lane is completely fine. Again, King East in the International Village is 2 lanes and is a freeway 23 hours a day. If we're going to scrap something on Hunter, let's make it the completely useless live lane. Reading this blog has been interesting. I want to keep the street parking. When this condo was built there was no requirement for visitor parking. When the houses were built there was no requirement for on property parking. I have walked the street from Liberty to Catherine and yeah it looks like 27 parking spots to me. I do support the three lane concept - one driving,one parking, one biking. I also support having bikers get licences to contribute to maintenance of the bike lanes. I haven't seen the bike plans the city has drawn up so I have no clue where the connections are going to be made for bikes. If the bike lane is going to go back to Jackson St and not past the Go, my question is why is the bike lane not going on Jackson? It is all paid metered parking and parking lot and very few houses where people actually live. I have no issue with people who choose to ride their bikes, I'd like them to be safe, and to follow the road rules. There's far too much negativity in this blog against car owners and drivers. I signed that petition and offered to have a public meeting in our condo meeting room because I believe there's room for everyone and every opinion. I also don't think that taking parking spots away and creating a double lane parking lane for bikers is a win win situation for anyone. I also support having bikers get licences to contribute to maintenance of the bike lanes. Are you someone under the illusion that the money collected for drivers' licenses pays for existing traffic lanes? City taxes pay for the streets. Why do you think that city cyclists should have to pay twice for the use of the roads while drivers only pay once? Thank you Jason (sorry for the mix up!) for your article and further comments about not losing curb side parking on Hunter. d'ad - the 27 spots are between Liberty and Catharine, the proposed path of the bike lane. Although I'm concerned about the parking that will be lost for the business, I'm also concerned about the spaces being lost for the people who live in the area. Although I don't speak for all of the residents, I have friends in the neighbourhood and I lived in the neighbourhood for years so I understand the daily task of finding parking. A concerned resident has co-ordinated a community meeting with councillor Jason Farr to be held Thursday July 27th at 7-8pm at the Condos at 175 Hunter Street East in the community room. They will be presenting a "preferred design", which hopefully means actual plans and communication. Where do your employees park? Not sure why it matters where my employees park, but the 1 full time staff member that drives parks in a pay lot down the street. It seems inevitable that when a new bike lane or road diet is proposed anywhere in the United States, business owners fret that a loss of parking will scare away customers. But as more cities pursue safer streets, more data is helping prove the dire predictions wrong. In fact, in many cases we’ve seen the opposite: cycling infrastructure seems to actually boost business.